The Saints and Vikings will battle in the final game of the Division Round slate Sunday afternoon. It is arguably the most anticipated game of the NFL postseason to date: Two top-ten scoring offenses against two top-ten scoring defenses. The Full Press Vikings staff makes their predictions for what will happen in this contest of NFC elites. Minnesota establishes the run game early while giving Case Keenum some easy throws to get his rhythm going. The Vikings defense sells out to stop the Saints’ one-two combo of Mark Ingram and Alvin Kamara, and makes the Saints pass happy. A late Kai Forbath field goal sends the Vikings into the NFC Championship game. Minnesota stops Kamara and Brees enough while the New Orleans defense has no answer for a solid Minnesota run game, which opens up the passing game, as well. Forbath has a pair of field goals to keep the Saints away in the second half. Latavius Murray should emerge as a dominant force against a less than stellar New Orleans defensive front. Additionally Keenum should excel at managing the game flow. Defensively, Kamara and Ingram’s explosive run combined with the future Hall of Fame talent of Drew Brees should be a challenge to Minnesota, but I expect this elite defensive unit to bend rather than break. This is the toughest game to pick all postseason for me. I firmly believe whoever wins this game will not only represent the NFC in the Super Bowl, they will hoist the Lombardi Trophy. The Saints have been my pick for a while now, so I am going to stick with them. But there are a few things that give me pause. For one, they showed vulnerability defending the middle of the field against an above-average but not great Panthers passing attack. Second, Minnesota matches up with their explosive offense better than any defense in football. That being said, I am leaning Saints because of Brees. I believe the Vikings will lead most of the way, but Brees will lead a game-winning drive, capped off with a last-minute field goal. 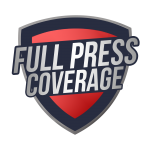 – Anthony Talanca writes for Full Press Coverage and covers the Minnesota Vikings. Like and follow @atalanca. – Adam Pearson writes for Full Press Coverage and covers the Minnesota Vikings. Like and follow @APwrites3. – Mark Gabreski writes for Full Press Coverage and covers the Minnesota Vikings. The Oklahoma City Gunslinger is the Vikings only chance of Winning a Championship, Does Zimmer have the ball’s to put The OCG in the game? Vikings @ Eagles: Who Has The Edge?